A perfect necklace for a mermaid, or the woman who wishes she was, the BEACHCOMBER handmade necklace is a beach beauty that will definitely set you apart from the rest who will be wearing humdrum jewelry. 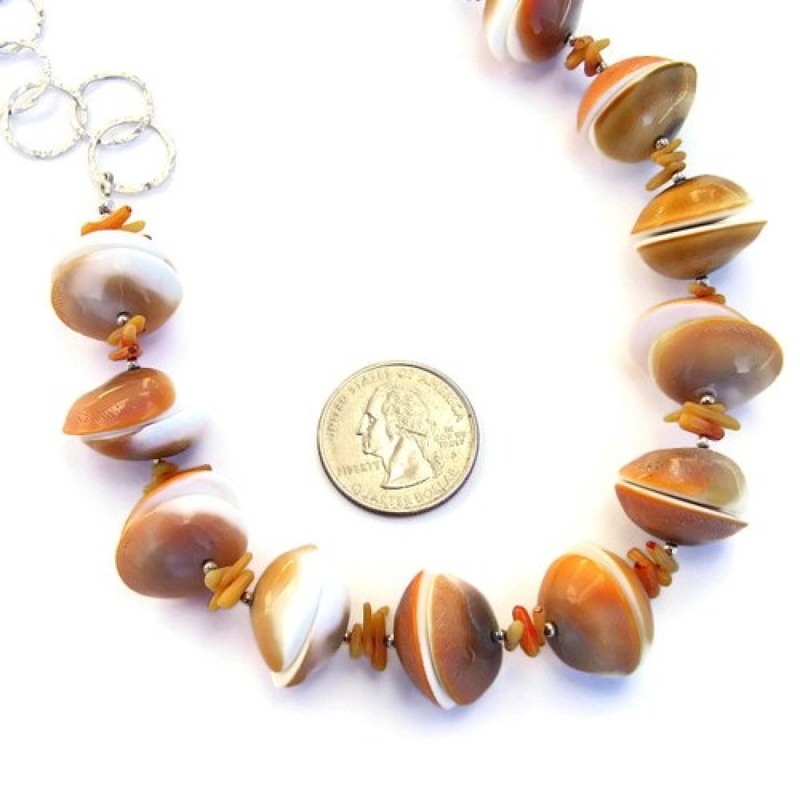 What catches the eye are the gorgeously organic orange and olive Eye of Shiva shells featured in the front of the necklace. 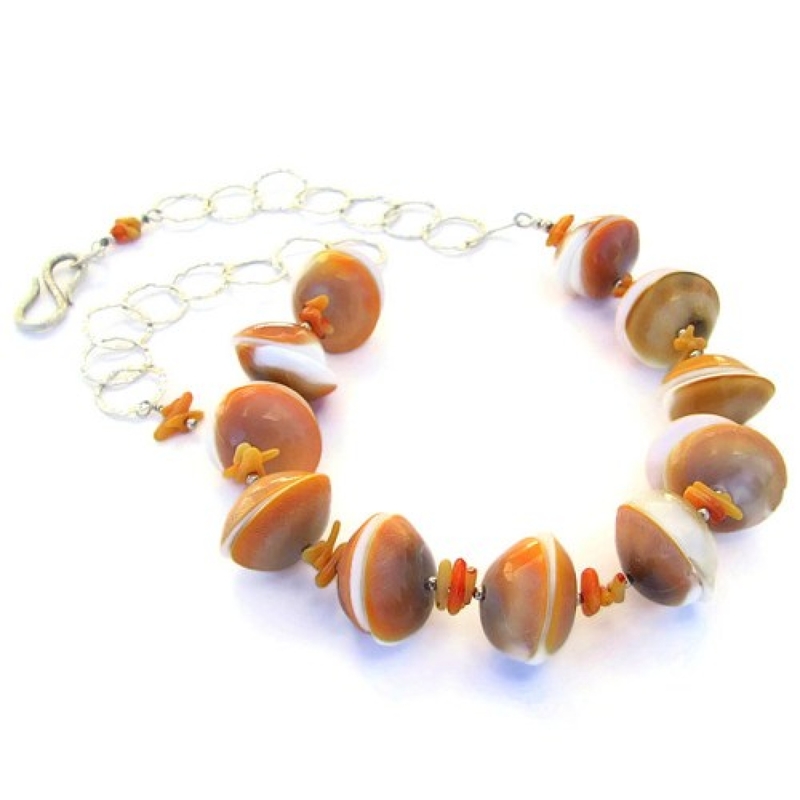 Orange coral frangia, hammered sterling silver chain and a brushed sterling clasp all add exquisite beauty to the design. A one of a kind design that cannot be repeated, the BEACHCOMBER necklace was designed and carefully put together by Catherine of Shadow Dog Designs for the woman who appreciates fine artisan jewelry. Eye of Shiva shell (sometimes called just Shiva shell) have a flat face and a domed backside. For the BEACHCOMBER necklace, I put two flat faces together in pairs to form a kinetic look. 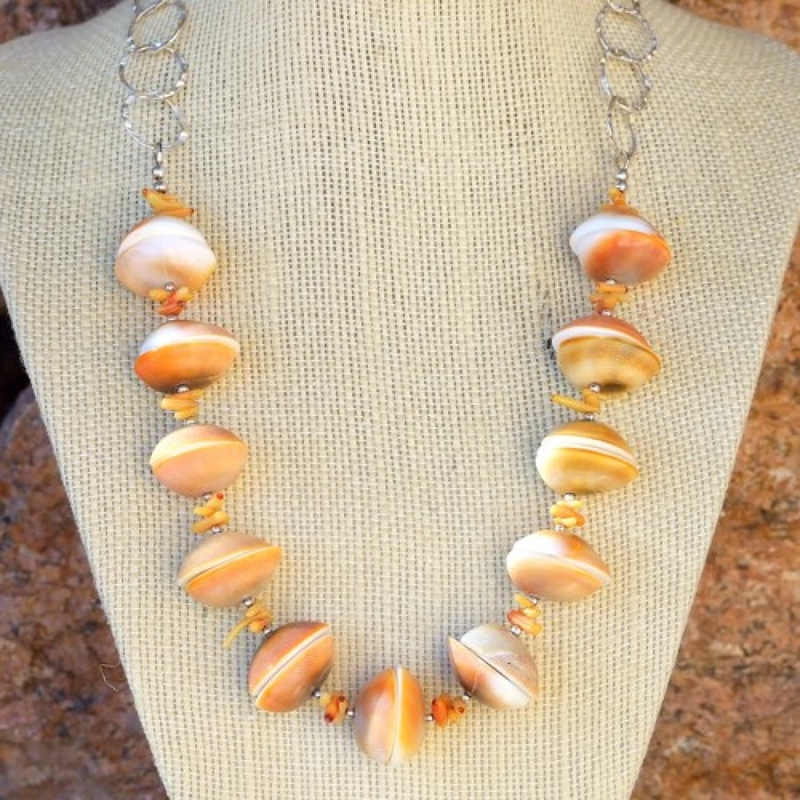 I love the way the shells turn as you wear it, presenting different textures and colors. 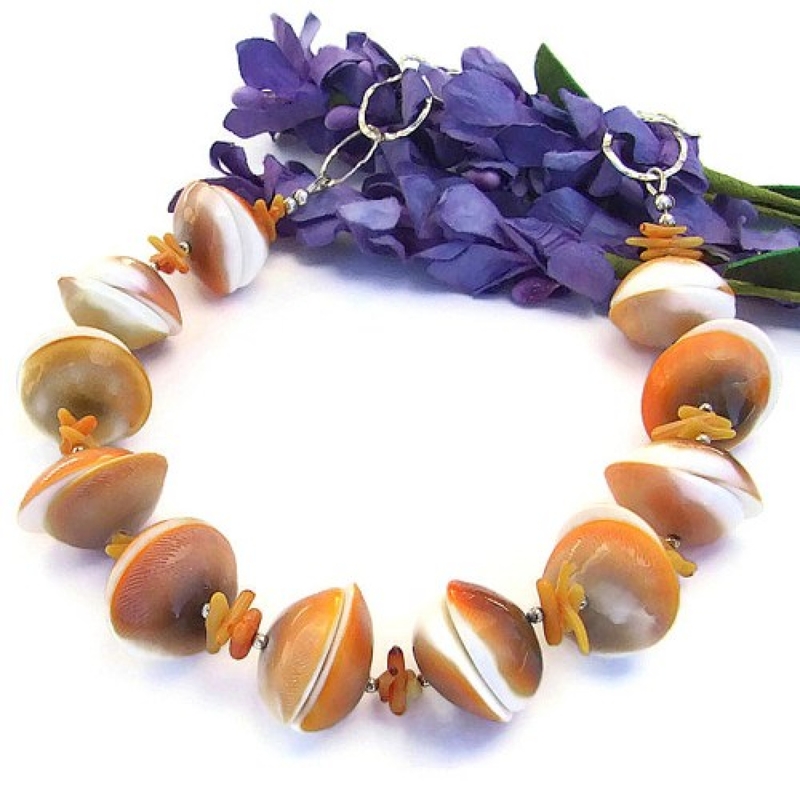 The colors of the shells are sublime, ranging from a rich orange to a light khaki green to creamy white. Colors that will look divine against a summer tan! The front shell section is app. 10" in length. Just what is Eye of Shiva shell? Also known as Shiva shell or Pacific Cat's Eye, the shell is the protective covering at the opening of a Turban snail shell. On the flat side of the shell is a beautiful spiral, the exact shape being unique from one shell to the other. Depending on the sea snail's diet, the color of the spiral varies from beige to deep green while the background always remains a milky white. On the domed side of the shell are beautiful color, usually oranges and olives that is said to resemble an "eye". When the snail living inside the shell detects danger, the door will be pulled shut and the "eye" side will be exposed with the hop of looking like a much larger creature to ward off the predator. 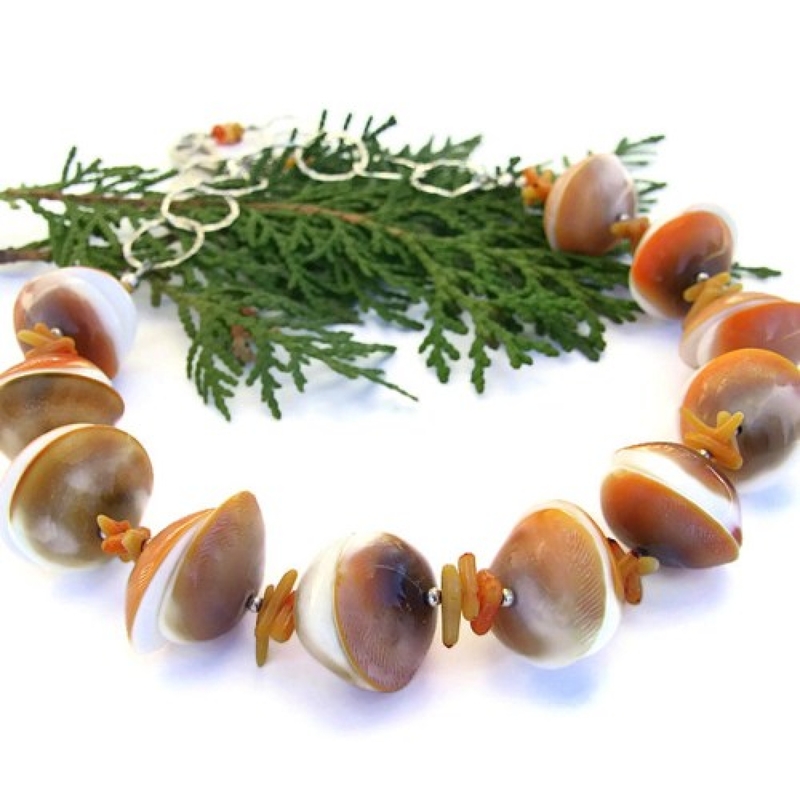 To add wonderful texture and add more orange color to the BEACHCOMBER necklace, orange coral frangia was used. Three pieces were used between each Eye of Shiva shell, separated from the shell by 2 mm sterling silver beads. The frangia complements the Shiva shells perfectly - a very welcome addition! To keep the necklace light and airy, I decided to use lovely sterling silver hammered chain for the back of the necklace. The shell and coral front part were connected to the sterling chain with sterling silver wire protectors. One end of the chain is finished with a brushed sterling silver s-clasp; the other end is decorated with a wire-wrapped coral dangle. The total length of BEACHCOMBER is approximately 19" from end to end but it can be worn shorter if desired. For a better understanding of the relative size of the Eye of Shiva shell used in the BEACHCOMBER necklace, please be sure to check out photo #5 for a size comparison with a quarter. Eye of Shiva shell has a strong representation in Hinduism, being the third eye in the middle of the forehead of the Hindu God, Shiva. Representing wisdom, it is thought to have the ability to look beyond the obvious. It also symbolizes the creation, the preservation and destruction of everything, the flow of life, the constant change of the universe, spiritual knowledge and creative visualization. Coral is said to bring mental peace and relieve stress. Silver is the metal of love and healing. The BEACHCOMBER artisan necklace will come with two informational drop tags: one with the piece's name; the other lists the materials used in the necklace and the language of the stones and metals. It will be carefully packed in an organza jewelry bag, perfect for gift giving to a loved one . . . or to yourself!